Kakatpur is a small village in Puri District and is situated at a distance of 50 kms from Puri, on the Puri-Astaranga road. Situated on the bank of river Prachi, this temple is famous for Goddess Mangala. 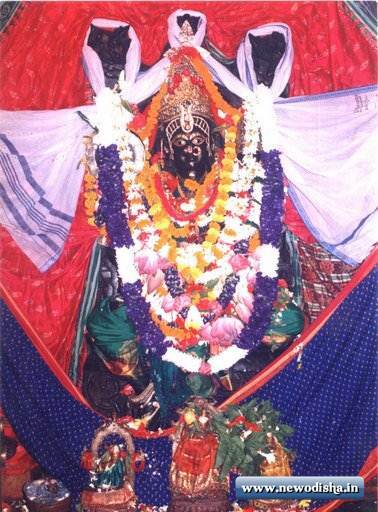 Goddess Mangala is the presiding deity of Kakatpur and is worshiped in this temple. There is a famous story behind the evolution of the name of the deity as ‘Kakatpur’ Mangala and believed by the local people. Goddess Managla kept herself hidden under the deep water of river Prachi. Once a boatman was sailing his boat across river Prachi. At that time the river was outpouring and flodded so he was unable to sail his boat to the middle of the river. He spent whole day and night but not able to sail his boat and during early morning, before the dawn, Goddess Mangala came in his dream and asked him to recover her from the water and to establish her in nearby Mangalapur village. The boatman dived into the water and able to find the deity from the bed of the river. Then as per the direction of the Goddess he established the figure of the deity in a temple in Mangalapur village. After this the boatman saw a black crow dived into the water and did not come out of the water for hours and days, the crow detained inside the water of river Prachi exactly in the same place from where he recovered the figure of Goddess Mangala. In local oriya language ‘Crow’ means ‘Kaka’ and ‘Detained’ means ‘Atka’. So by combining the two words it becomes ‘Kaka-Atka’, so during the course of time the Mangalapur village is know as ‘Kakat’ (Kaka-Atka) pur and the Goddess is known as Kakatpur Mangala. Kakatpur Mangala temple has a close relation with Lord Jagannath temple of puri during the Navakalebara (Renovation of the Deities) festival. Old deities are buried under earth at the dedicated place inside Jagannath temple and new idols are created for Lord Jagannath, Lord Balabhadra and Goddess Subhadra. The new idols are created from a sacred wood known as ‘Daru Brahma’ in local language. Nobody knows from where to find the sacred wood to create the new idols, so as per the tradition the priests of Lord Jagannath temple come to Kakatpur Mangala to pray the Goddess to help them to find the sacred wood. The priests seelp in front of the Goddess with their face down and then Goddess Mangala come in their dream and tell the exact location of the three sacred trees for the three deities. This custom has been performed from years together without any deviation. This shows the power and energy of Goddess Mangala and her blessings for her devotees. The most popular festival of Goddess Mangala is ‘Jhamu Yatra’. It occurs on the first Tuesday of the Secred month Vaisakh (April 14 to May 15) every year. On that occasion devotees collect sacred water from river Prachi and pray the deity to get her blessings, then with the earthen pot , filled with sacred water, on their soldier, they are able to walk on the surface of burning fire spread on a long channel on bare feet. Due to their faith on Goddess Mangala and their Mother’s blessing on them, the devotess are unhurt and uninjured while perferming such a risky custom. Every year thousands of devotees come to Kakatpur to celebrate the Jhamu festival. This temple is beautiful and beautiful. This truth is a temple of Goddess of justice. I came here and found peace. Give Responses for "Kakatpur Maa Mangala Temple of Odisha"